West Haddon Players will be taking a step in a new direction with a show involving love, magic and misunderstanding next week. The group will perform A Midsummer Night’s Dream, the first time they have taken on a William Shakespeare play. It runs at West Haddon Village Hall from Thursday to Saturday, June 15 to 17. The group has described the show as a romantic comedy, a light hearted introduction to Shakespeare for both the audience and the cast. 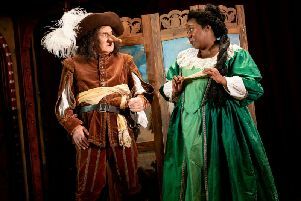 “Even though we have tackled some spoofs and extracts of Shakespeare in West Haddon over the years, this is the first full length play by the Bard that we have done,” said group chairman Richard Lilleyman, who is playing Bottom – one of Shakespeare’s great comic characters. Performances start at 7.30pm each night and there is a licensed bar. Tickets for the show are £8 for adults and £6 for concessions. For further information about the show or to book tickets in advance call 01788 510503 or, alternatively, people can email jane@shepherdsrow.co.uk.